Our Needs and how you can help! We are thrilled to indroduce this new program. 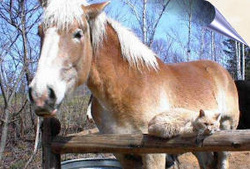 Cats have been helping farmers for as long as one can remember in keeping out vermin. So we thought why not? As long as a farmer will feed and provide shelter for these cats lets get them to the farmers. Please save a life! Our shelter director called us on the first day of the program to let us that know that 7 feral cats were wanted. What a GREAT feeling. We request that the farmers have a safe enclosure for the cats such as a barn with an elevated structure of some kind to protect them from the elements and coyotes and that they are fed daily. A cat will do what a cat will do whether or not its fed. There is no need to starve a cat in order to get it to hunt. Fixing these cats also keeps them close to your property and eliminates unwanted behavior such asAnd even though these are feral cats they are still worthy of being treated as one of the creators creatures. If you are a farmer who is interested in receiving these cats plese please contact us at Pawsrulecares@aol.com. Or call the shelter 910-592-8493.